We live in an economy where entrepreneur­ship is king, especially in the resurgence of De­troit. Forming a start-up with no prior knowledge of where to begin can be difficult to research for many and discouraging to most. “A lot of people have never seen what this (entrepreneurship) looks like, they don’t have it in their family and they’re not associated with friends who are entrepreneurs,” said Dr. Nicole Farmer, CEO of Lifeline Business Consulting Services. Lifeline provides business consulting ser­vices to inspire minority men and women in every stage of entrepreneurship. Recently they launched the Entrepreneur Hub in partnership with Grand Innovations. 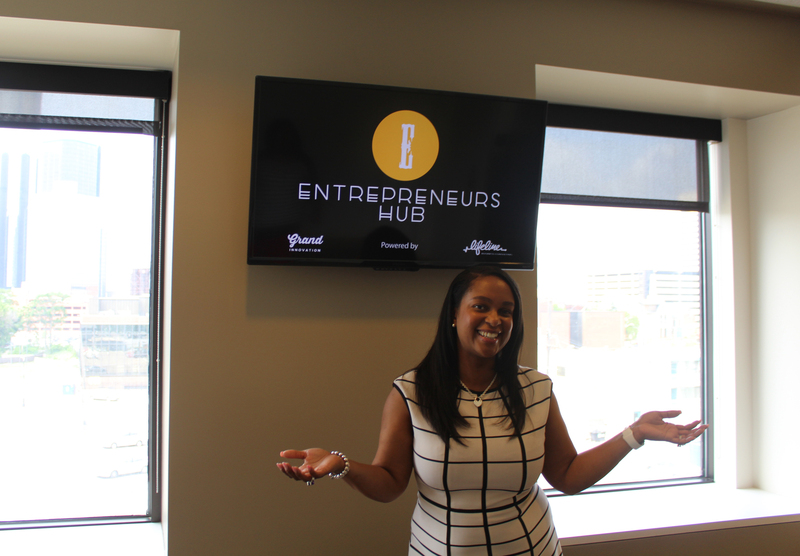 Entrepreneur Hub is a co-working and small business space looking over the scenic riverfront of downtown Detroit, located at 1400 Woodbridge Street. Business owners are able to come out of the coffee houses and cafés to offer clients a pro­fessional and private meeting space. In addition, classes will be held onsite starting in August. Through recent part­nership with Detroit- Mi­cro-Loan Collaboration, comprised of The Wom­en’s Foundation and The Detroit Development Fund, Lifeline is able to get individuals loan ready, even those who have felo­nies. “We’re (Detroiters) not loan ready, but we’re here to help you through the process, holding your hand through loops, up and downs,” said Farmer. Lifeline has provided over 50 entrepreneurs with the tools and re­sources necessary for securing funds for their business. Among them are Monica Lynn Brown, Breathe Beauty Bar found­er and owner, who cele­brated her grand opening Saturday. “We helped her for the past year understand and cultivate her business plan and being able to pitch properly to be able to get the loan dollars for her to (operate) this huge business,” said Farmer. Dr. Farmer’s holistic approach helps when it comes to obtaining fund­ing by coaching on the do’s and don’ts of a pitch. “If things are going bad, sometimes your house­hold isn’t right, let’s talk about it, so when we are in front of the funders you know what to say and how to say it,” said Farmer. Farmer’s suggestion for entrepreneurs who have the gift or curse of gab: “Look at your watch before you get started and say, I am going to speak for the next 60 seconds about my business or the next minute and a half about my business … give them three points right at the beginning and a business card if they ask. You’ve downloaded an image of your brand, they will remember your name know what you do,” said Farmer. Lifeline and Grand In­novation have created the perfect melting pot for as­piring entrepreneurs and current entrepreneurs who have started, but need help taking the next step. “Being in a place with like-minded individuals, who are also dreaming, passionate and going after something people are typically telling you (that) you can’t do … Life­line allows you to have a safe place where you can cultivate this dream,” said Farmer. Application process and affordable rates for aspiring business owners are available and can be found at www.entrepre­neurshub.space. For more informa­tion please contact T. Marie Media Group at 248.716.0240 or via email at tmariepr.com.